Eric Bailly, 23, has collected two yellow cards in the 2018 World Cup qualifying campaign and will miss the Elephants' crucial match against Morocco through suspension. 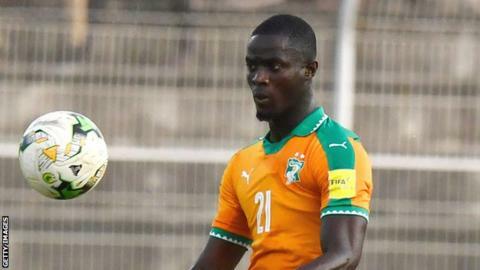 Ivory Coast will be without experienced defender Eric Bailly for their crunch World Cup qualifier at home to Morocco on 11 November. The Manchester United star is suspended for the game in Abidjan having collected his second booking of the qualifying campaign in the 0-0 draw against Mali in Bamako on 6 October. The Ivorian Football Federation (FIF) confirmed that Bailly, who received his first booking in their 3-0 win against Gabon in September, will serve a ban for accumulating two yellow cards. Morocco have a slender one-point lead over the Elephants in Group C of African 2018 World Cup qualifying and both countries will fight for the sole group ticket in the final group matches next month. Ivory Coast, whose 2015 Africa Cup of Nations title came when current Morocco coach Herve Renard was in charge of the Elephants, must win the game to reach their fourth World Cup in a row. The North Africans, who only need a draw, are bidding to appear at the finals for the first time since 1998, when they exited in the group stage. In 1986, the Atlas Lions became the first African country to win a World Cup group as well as reach the second round of the tournament. The World Cup in 1998 aside, the 1976 African Champions also finished in the group stage in 1970 and 1994.